BlackBerry is still struggling to attract more users, as it releases yet another device in hopes of gaining more market share and restoring its tarnished reputation. The BlackBerry Z3 (also called the BlackBerry ZZZ and the B-Berry Snooze in various markets) is designed to let you receive and respond to messages while asleep and is its latest foray into telepathic telecommunications. The company was once the darling of the telepathic telecom industry, but interestingly enough started out as a cellular paging tele-communicative phonograph (or "phone" as they were called) company, where it faced a similar erosion of market share. BlackBerry "phones" used to dominate the market, so much so that their phones were deemed to be "smart" while competitors units were considered to be of significantly lesser intelligence. However, other companies eventually made great headway in bringing sleeker and feature-rich phones to market. Market share for BlackBerry free-fell from above ninety percent to hovering just above two. Successive CEOs like Thorsten "Thirsty Thorsty" Heins and John Chen (who employees affectionately called "Mama Chen"), tried varied strategies based on consumer feedback. First, making a more modern touch screen device (consumers wanted more of a classic throwback device). Second, by making more of classic throwback device like the popular "Bold" (consumers responded by saying they wanted more of modern cutting edge phone). The once mighty giant of telecom was reduced trying to scrape together revenues from sources ancillary to sales of phones, which were always produced at a loss. 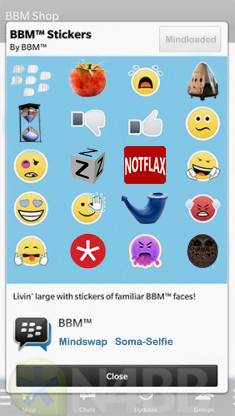 Some strategies were strategic acquisitions to complement their business, monetizing BBM (a proprietary messaging service), and eventually were reduced to selling virtual stickers across these services. But in this unassuming side business, was BlackBerry's redemption. Stickers eventually came to account for almost 98% of revenue, far eclipsing any income from lagging phone sales. The importance of the sticker segment was such that the company, once again, became a pioneer by pouring money into R&D for the development of mind-control and telepathic communications as avenues to further increase sticker sales. BlackBerry eventually realized this could be used for general use communications. The impact on the industry, and the company, was dramatic. Competitors such as Google and Apple, that were once squeezing BlackBerry out of the market, were decimated to the point that they had to completely abandon the telecom industry (a note to readers; this was an enormous blow as it would still be years before Google and Apple would become dominant players in the SkyNet and Terminator industries respectively). And for many years, BlackBerry was once again riding high. But unfortunately the good times did not last. Competitors like Foo-Phone and the Super-Happy-Big-Big-Global Telecom Corporation, based out of Japan, became innovators in the field. One of the main criticisms of the B-Berry Snooze is that it's still trying to appeal to the business market. The rationale for the Snooze was that by being able to answer messages while asleep, users could boost productivity, hopefully making it appealing as a corporate device. But the consumer market has no desire for answering work mail while asleep because, as in the words of one consumer, "That would make them think, like, they're so important... when they're really not." The biggest social trend in recent memory is "blazé", making the people closest to you think you want nothing to do with them. Users want to snap unconscious photos of themselves while sleeping (soma-selfies) and send them to their network to give them the impression that they're always the most important person, even while asleep. The more things change, the more things stay the same. Google, Apple, decimated in the telecommunications industry. BlackBerry still hanging on by a thread.